The month of January is a great time to pause and recover from the insanity of the holiday rush. 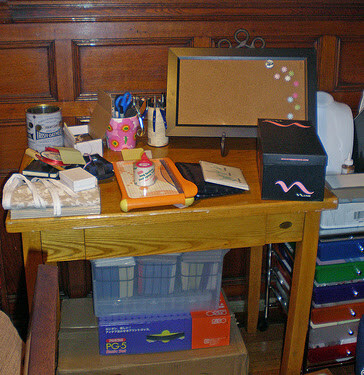 You can see a lonely pack of holiday cards and my craft fair apron on the desk here--- as well as mailing supplies and the attempt to start an "inspiration board." What's really evident to me is the challenge of what I'd call "apartment life." As a city dweller, I am constantly rearranging the little alcove that is my studio. It's such a small space that it's difficult to make it functional and an inspiring, attractive place to work at the same time. When I do print work on my Gocco, the folding table and drying rack come out and basically take over the whole living room! Angela, I don't know how you create such great stuff in such a tiny space!